Bird-Leaf Cable Tidy Clips. 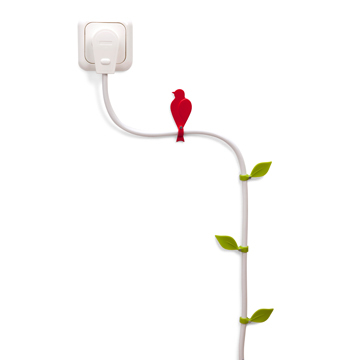 Decorative cable tie includes a red bird and 12 leaves to decorate and keep your hands on that cable is loose and always misplaced. Never dreamed that secure the wires to the wall could become a very creative task. + 12 cable tie bird leaves to let your imagination fly all the time to secure a cable to the wall, besides decorating that part of the wall.